REVOLUTIONS OFTEN END badly (think France, Russia, Iran). 1989 was an exception. 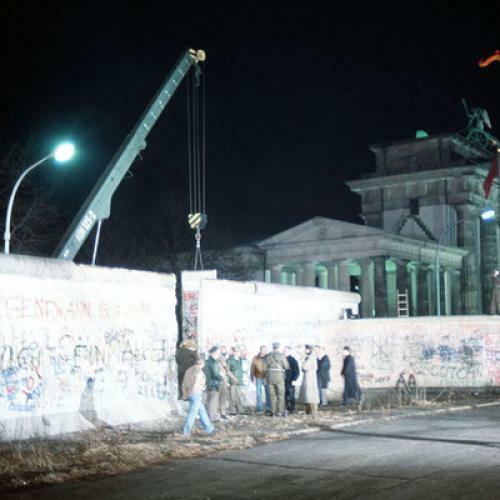 Yet the velvety days that followed the fall of the Berlin Wall were blemished, too. Four Balkan wars of the 1990s left over 100,000 people dead, and displaced a couple million. The Soviet Union sank with less bloodshed in the Caucasus, Moldova, and Central Asia, though more than tends to be remembered; and the political, economic, and psychological traumas have proved lasting. Beyond the European Union’s new eastern frontier are countries, without exception, marked to this day by repression, obscene corruption, or violent conflict. Lawrence Scott Sheets spent two decades in these lands. Eight Pieces of Empire: A Twenty Year Journey Through the Soviet Collapse, a memoir of the collapse and aftermath, is not a happy tale. Sheets relies almost exclusively on anecdotes, which can leave a reader grasping for wider scope and analysis, but the breadth of his experience helps. A penniless American student of Russian, Sheets lands in 1989 in a city whose name is soon expunged from the map, in a country that no longer exists, in an era that feels more than a generation removed from our own. Leningrad then was an agitated place. Mikhail Gorbachev’s glasnost (openness) and perestroika (reconstruction) were intended to reform the Soviet system. A KGB agent, who half-heartedly tries to recruit the young Sheets, cries crocodile tears over what he knows is—as most of his compatriots fail to grasp—the empire’s coming downfall. Most people that Sheets meets in Leningrad had other interests then—American jeans and watches, and early tastes of easy money. An acquaintance of his quits a boring, safe job at a state factory and goes into petty racketeering. Some street thugs became billionaire oligarchs, and a new mafia would soon turn Russia, with the help of the KGB and the Communist elites, into a post-Soviet Sodom of slimy nightclubs and easy decadence. Most people, of course, had a different experience, seeing their savings decimated by hyperinflation and their lives upended in the anarchic years after 1991. The late Soviet world conjured up by Sheets feels like a bizarre, almost innocent time. He lived in a kommunalka, or communal apartment, shared by a group of strangers randomly thrown in together by local Soviet housing authorities. When his elderly host leaves to spend the weekend at her dacha, she makes the American swear to never, ever leave the television on at night. “This was an oath not to incinerate the communal in her absence,” he writes. “Soviet televisions were known to overheat and explode if the power cord was left in the wall.” The kommunalkas were petri dishes of lifelong resentments. The alternative was the “crumbling, battered, cookie-cutter-identical high-rises” where most Russians lived. These “suburbs of the future” were soon to become ugly concrete leftovers of history. When the Soviet Union dissolved with a whimper at the end of 1991, the worst case scenarios drawn up by CIA analysts did not come true. Russia stayed together. Ukraine was the powder keg that occasionally threatened to blow but never did. The peripheries were not so lucky. Moldova’s trans-Dniestr, much of the Caucasus, and Tajikistan exploded. While each conflict was different, all were stirred by ethnic tensions, inept or opportunistic leaders, criminality, and Russian meddling. War sucked Sheets into journalism, for Reuters and later for NPR. He spent the most time in the Caucasus, which is the setting for the most memorable parts of his book. Famous for skiing and palmy beaches, passable wine and delicious cuisine, Georgia was an incongruous battleground. Georgians were the bons vivants of the Soviet Union. Their civilization and their Christianity went back a thousand years further than the Russia’s. They viewed their northern masters with quiet condescension and fear. For centuries, Georgia was overrun by Greeks, Mongols, Ottomans, Persians, and Russians. Their mountain tribes never had a chance to build a unitary state, and they missed their best opportunity in the early 1990s. A national penchant for “maximalism,” in the words of a Georgian in Sheets’s story, helped lead Georgia into the folly of wars that almost destroyed it, and sundered it for a long time to come. Sheets saw the conflict in Abkhazia up close. Almost twenty years later, Abkhazia and South Ossetia, another breakaway region whose “independence” is bankrolled by Moscow, flared up again into a brief and losing showdown with Russia. Plenty of blame goes around for the original sin of Abkhazia. Sheets lays most of it at the feet of the Georgian leaders, who allowed such atrocities as the burning of the Abkhaz national archives. He first meets one of them on an airport runway, in a coffin. A nationalist madman, deposed President Zvyad Gamsakhurdia was killed with a single bullet through his temple—whether by his own or another’s hand will never be known for sure. “Perhaps most curiously of all, the ousted president wears no shoes,” writes Sheets, adding parenthetically that, “this elicits rumors of all fashions, noteworthy among them that Gamsakhurdia, an Orthodox Christian, converted to Islam before his death.” He is slightly kinder to Eduard Shevardnadze, Gorbachev’s foreign minister who comes home to lead Georgia. He helped his nation to survive but not to prosper, and was overthrown in the region’s first “color” revolution in 2003. Chechnya was the post-Soviet world’s Bosnia. Russia’s leaders were never held accountable at home or abroad for a decade-long massacre that bordered on genocide. As usual in the Caucasus, the troubles started for a stupid reason long forgotten. In late 1994, mocked by renegade local leaders, Boris Yeltsin sent the Russian army to bring Chechnya into line. The decision, writes Sheets, was “made in a bath-house by naked, drunken men during a birthday celebration for the country’s defense minister, Pavel Grachev.” The Russian troops were humiliated. When Yeltsin faced a tough re-election fight in 1996 and stinging criticism on independent television, he sued for peace. Yeltsin’s successor, Vladimir Putin, solved the problem by eliminating competitive elections and free media. He re-invaded Chechnya in 1999 to consolidate his hold on the Kremlin and subsequently razed Grozny. Through the first half of the last decade, the province was a no-go zone of kidnappings and Islamic extremism before Putin decided to pour billions of his petro-rubles into rebuilding what he destroyed. At the end, Sheets says he was scarred by these messy conflicts. Several of his friends and colleagues were killed. He likens the experience of being a war correspondent to overexposure to “radiation,” with little further explanation, which is a pity. As well as he tells some of his stories, Sheets fails to make a steady emotional connection with his reader in the way that, for example, Dexter Filkins did in his Iraq memoir The Forever War. Nothing in Sheets’s book ought to make one nostalgic for the placid, repressive stagnancy of the late Soviet period or rueful about its passage. You can say the post-Soviet world could have turned out better, but it doesn’t strain the imagination to say it could have turned out worse. Sheets makes no firm judgments. He offers no prescriptions. He sticks to his stories. At its best, Eight Pieces of Empire is a unique, readable, and bracing work of eyewitness history by a brave foreign correspondent who risked his safety and more to document it.